When Jonah Markowitz was doing a residency at the San Francisco Film Society four years ago, a neighbor had suggested he meet Carole Migden. The director, who previously helmed the narrative feature “Shelter,” hadn’t a clue of how big a story Migden had until sitting down with her, providing the foundation for his first documentary (co-directed by Tracy Wares), “Political Animals,” a riveting chronicle of the slow but steady activism of the first four openly gay California legislators — Migden, Sheila Kuehl, Jackie Goldberg and Christine Kehoe — whose political savvy, cultivated during the women’s rights movement of the 1970s, and steadfast commitment to the cause of equality for the gay community laid the groundwork for gay marriage not just in the state but in the nation. 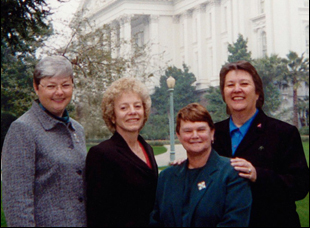 In a history recounted exclusively by the four women themselves, the film is driven by their passion, charting every meticulous move of grassroots-level organization and making their every address to the State Legislature electric. In advance of a barnstorming festival run following its premiere at the Los Angeles Film Festival, Markowitz spoke about uncovering the remarkable founding of the California Legislative LGBT Caucus, sifting through hours and hours of footage from the California State Assembly floor to find what he needed and how he hopes the film will inspire a new generation to get involved in politics. I went and had lunch with Carole, and I was trying to find what the story might be to do a whole film. She started talking about the other three women that were all in Sacramento when she was and I thought it was really interesting that there were four [gay] women that were able to be elected before any gay men were. That wasn’t something that normally happens in politics where women are allowed to be elected before men by society, so I wanted to know more about that and that shaped the idea. Did the structure of this come naturally to you? There’s a great a passing of the baton quality to it. I don’t think it was easy finding the path for this film. I had done pretty extensive pre-interviews with all the women and really talked to them to figure out how we wanted this story to be laid out, then working out how we would come in and out of the [State Legislature] floor footage, and how we would get you caring about the women and knowing a little bit about them as people, so you could identify with them, understand who they were and the challenges they faced in running for office. Eventually, I think everything landed in the right place. We did take somewhat of a chronological approach — when you’re in the section of the film that’s really dealing with the bills because what these women really did was create incremental change. They all were very strategic in knowing what they had to do and there’s parts of the film where they’re saying, ”Don’t worry. This isn’t gay marriage.” When we did our our main interviews about three years ago, gay marriage still hadn’t happened, but we knew it was coming, [though] none of us thought it was coming as quick as it did. They all said that gay marriage wasn’t even a goal when they were in office. It wasn’t about the words. It was about getting some basic rights for domestic partners. If you started three years ago, did you have a different film in mind without the major strides that happened in the interim? Not very different. Gay marriage was an end goal but we didn’t want to make a film about gay marriage because while that does give you the largest group of rights in one fell swoop, there’s other amazing things that have happened. There’s other rights that we’ve gotten through bills that these women passed, so when gay marriage passed, of course it became a part of our story especially since these women laid the groundwork for it, but it didn’t significantly change the film because the film was always about women and their contribution to civil rights struggles in America specifically the LGBT community. In the film, it’s alluded to that there was a mild tension between gay men and women since naturally the approach to political activism might be different. Was it interesting for you to be telling this story? I never had any reservations about it. I’m happy to tell it because it is a story for the whole community and even people that aren’t in the community. It’s a very universal story about how rights are achieved, but what happened is when the gay rights movement needed to become political, in the sense of actually [having a seat] in the legislature and getting laws passed, what we found was that many of the gay women were more political. At the time, we had been through the women’s movement and been through marching for choice. They knew how to organize and how they’d been discriminated against in the past, so they knew how to do that part. Such a big piece of the population unfortunately passed away with gay men [because of the AIDS crisis], but that didn’t happen to this generation of women, so there was this whole generation that was politically savvy and motivated. As [the women] describe [in the film], it’s still much more acceptable in broad society to be elected as a gay woman as opposed to a gay man. Before digging into it, were you actually all that familiar with what these four women accomplished? No, and I don’t think many people are. Hopefully, a lot of people see this film and can be inspired to understand what it takes to make real social change. Did you have to go through hours and hours of legislative footage? We did. Luckily, we were such a marginalized community that these were very heated debates we were watching. Normally on the senate floor, it’s boring, but the bills that are in our film are anything but. The insults and the vitriolic rhetoric that comes out of these people on the floor, even though they’re sitting there with lesbians and they’re on public TV, was just mindblowing. One of our concerns was that we’d need to make this footage engaging and exciting in a film, but it certainly was all in these extremely heated debates. They were in a battle for our rights. Was there a specific piece of footage that took you aback? It was more the tenacity of both our subjects and their opponents that you keep them seeing coming back onto the floor and back onto the floor and back onto the floor and arguing against each other. You see these two opposing forces just duking it out. That’s what made it interesting for me is that one of the women would bring a bill to the floor. It wouldn’t pass and then a year later, they’d be back arguing for rights again and the same guys would stand up and say the same things, banging their bibles, so hellbent on not letting anything pass, so it was seeing that continue to play out, becoming this Herculean effort to get these bills passed. You really confine the interviews to the four women, which becomes quite powerful, but had you considered broadening the reach of this? We did and we shot some other interviews, but at the end of the day, it was important that these four women tell the story and let them walk us through this history. Was it different for you, coming from narratives to make a documentary? It’s a very different process. Luckily, I worked with the same producers that I’ve worked with on my narrative work, as well as my editor, so I had people I’d been telling stories with for a long time. It’s a different language and the way the story comes together is very different, but if you’ve got a great subject, a great script and you have a clear vision and a story you want to tell, eventually you’ll get there. You leave this on a note that the fight is hardly over. Is there a larger campaign planned around the film? From the very beginning, everybody on our team has really been adamant that this be a film that affects a younger generation and shows them what a political animal is. Spreading the word on social media, getting awareness and having a movement is really important. You can’t have a social change without a movement. It normalizes it. At some point, someone’s got to get into office and get that seat at the table to continue to fight for our rights. We hope that this is part of a much bigger campaign and that people watch it, especially young people, and are inspired by our women to become political animals their own and to fight for their communities. “Political Animals” does not yet have U.S. distribution. It will screen next at the Frameline Film Festival in San Francisco on June 19th at 11 am at the Castro Theatre and June 20th at the Rialto Cinemas in Elmwood, Outfest LA at the Directors Guild Theatre in Los Angeles on July 14th at 5 pm and the Denver Film Society on July 24th at 2 pm. Frameline '16 Interview: Eric Juhola on Capturing Transgender History in "Growing Up Coy"
Interview: James Solomon on a Decade Spent on Preparing "The Witness"